GIRL POWER - Book 1: Girl to the Rescue is a Perfect Book for Girls ages 9-12! Girls can do ANYTHING! This is a wonderful story for all fantasy loving girls. It is a story about queens, kings, knights, wizards, and magic mixed with regular middle school drama...even the occasional boy crush. For our main character, Gwen, who was once a famous queen, life has become more complicated than ever. After being thrust into her new life in the future, along with every-day middle school issues she also has to deal with the presence of the evil Morgana, who has come to take over the new world. Can Gwen find the help that she needs? Will she eventually track down her loyal knights and will they be willing to assist her in conquering the bad guys? Or must she rely solely on her talking cat, Merlin? This is a fight between good and evil where the girl is the hero! Follow the exciting journey of Gwen, who was once a famous queen but is now living as a thirteen-year-old girl in a modern world where girls can do anything if they set their minds to it! 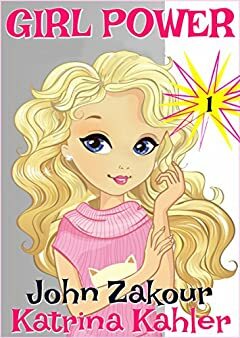 'Girl Power' is another fabulous series that girls of all ages will love to read.